March 21, 2016 – Project PoSSUM announced today that 12 PoSSUM members will conduct the second phase of commercial spacesuit testing in zero-G environments this July 26-29, 2016. The experiment will be performed through a series of parabolic (zero-G) flights provided by Integrated Spaceflight Services (ISS) of Boulder, Colorado, to further evaluate the Final Frontier Design (FFD) 3G IVA spacesuit in zero-G conditions and extend upon phase-one tests that were successfully completed in October 2015. The first phase of tests evaluated the test subject’s range of motion tests, fine motor skills tests, seat egress and ingress tests, and assisted seat ingress tests through a series of four flights. The second phase of testing will evaluate a prototype seat, the suit/seat interface, and the operational envelope through a series of three flights. These tests will also mature an in-flight suit pressurization system and a biometric monitoring system. “This second phase of testing will serve as a dry-run for a NASA-selected flight opportunity in which the suits will be evaluated fully pressurized,” said Dr. Jason Reimuller, Executive Director of Project PoSSUM. 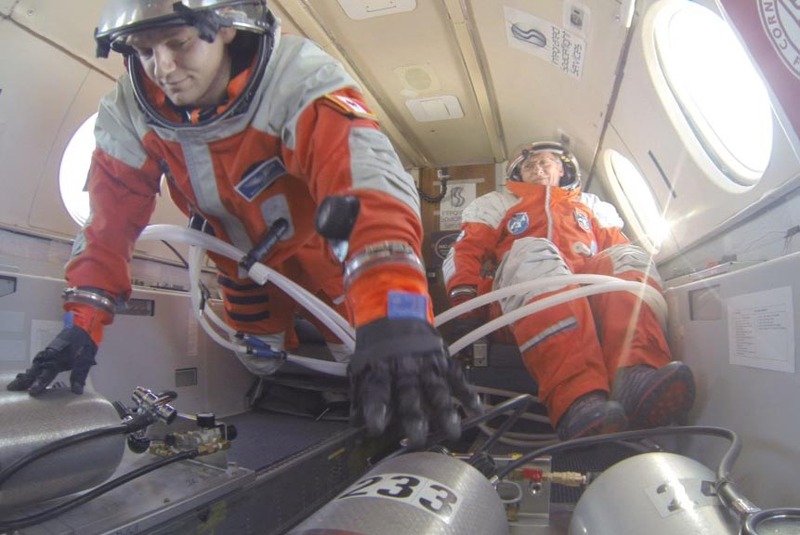 Last January, the FFD proposal “Testing of a Novel IVA Space Suit” was selected by NASA’s Flight Opportunities Program, and FFD’s flight operations partner ISS is arranging the flights on a Falcon 20 research aircraft specially modified for microgravity operations. The Falcon 20 aircraft was chosen for its exceptional quality of microgravity that best approximates the space environment, as well as a cabin interior that best replicates several space vehicles being produced. “The purpose of these tests is to increase our technology readiness level (TRL) through human testing in a high fidelity, relevant environment. The results will be used to validate pressurized suit performance under live, unpredictable conditions and further our milestone goal of obtaining flight safety approval from the FAA,” says Ted Southern, President of FFD. PoSSUM, an acronym for Polar Suborbital Science in the Upper Mesosphere, is a 501(c)(3) non-profit research and education organization that conducts upper-atmospheric and space technology research and communicates the science through various educational outreach programs. The next PoSSUM citizen-science programs will be held at the Embry-Riddle Aeronautical University in Daytona Beach, FL. from April 8-13, 2016. Interested individuals may apply to the ‘PoSSUM Scientist-Astronaut Qualification Program’ or the ‘PoSSUM Spacesuit Evaluation Program’ through PoSSUM’s webpage: projectpossum.org. Integrated Spaceflight Services, LLC, is a Boulder, Colorado-based company founded in 2010 that provides payload qualification, test and integration services as well as space research and education services through its non-profit affiliate organization, Project PoSSUM Inc.